Och, it’s not long after midnight and my room is swealtering. It was another un-remarkable day in the office today, same old same old ‘natural’ air conditioning. Hmmmm….. that’s why I was on my 5th bottle of water and still sweating like I’ve just spent 5hrs moshing away to rock and metal. One of ray of light though, Sunil suggested that we head down to Canary Wharf (yes the place with all the big buildings) otherwise known as ‘Torchwood Towers’ – although I couldn’t quite see any Daleks or Cybermen……. Glen and I headed down to a pub on the Wharf to meet Cameron, and yes I was still sticking to no beer on a week day, with me on the grapefruit and lemonade with Glen enjoying a nice cold Kronenberg. 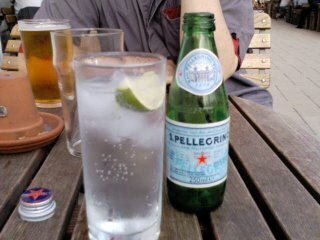 Cameron turned up later , and I had another sparking water. 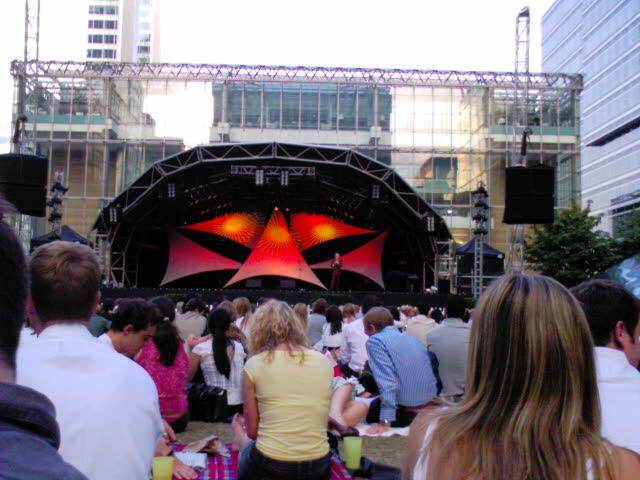 After which, we strolled up to Canada Sq for the Open Air Comedy Night, meeting up with Sunil and his wife Sabina. When we finally found Sunil & Sabina – as you can tell by the photo, loads of people sitting on a square of grass, kinda difficult to spot people! We sat down, had a picnic of cheese, dips, breads etc. Very tasty as there was a Waitrose across the road to beef up our supplies! 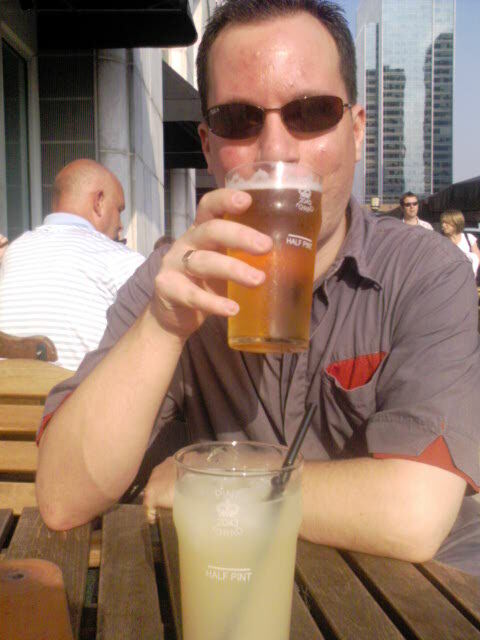 And well, this can be classed as a ‘special event’ so I had a couple of cans of Pimms and lemonade. I must say for a free event, it was bloody good. Lots of laughs, and even the Australian comedian was funny…. After spending most of Sunday sitting on my arse on the grass in Greenwich, my back didn’t take to kindly to sitting on the hard grass again for another three hours – so inbetween sets I had a nice lie down staring up at the fluffy little clouds (if only there were some!) 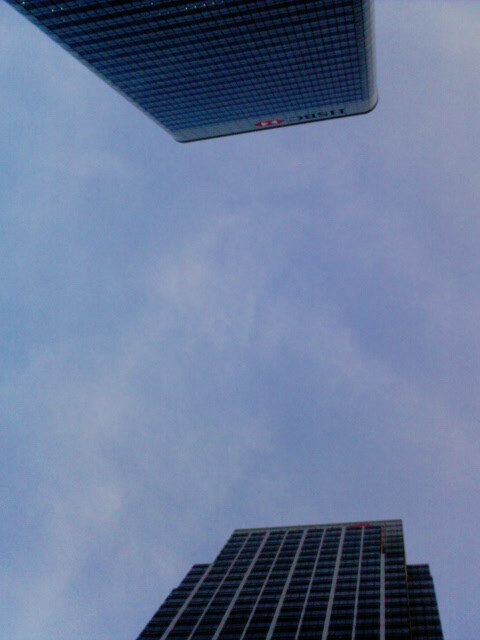 and at the big tall buildings. So, here I am, back home courtesty of TfL’s bus service, in bed, in the heat, listening to Planet Rock on my DAB Radio. Time for sleep I think! 25 Jul	This entry was published on July 25, 2006 at 10:52 pm and is filed under Personal Blog. Bookmark the permalink. Follow any comments here with the RSS feed for this post. Older: Where did it go?